What’s a little permanent brain damage when you’re facing a life of debilitating poverty? This Sunday, citizens across these United States will indulge in the country’s most cherished pastime: watching large men give each other life-threatening concussions. For about twenty weeks, millions of us sit riveted as players in the NFL collide into one another at breakneck speeds, delivering bone-crushing hits that thrill and excite, and it all concludes on our favorite holiday, Super Bowl Sunday. Buckets of chicken and kegs of beer will be consumed in raucous atmospheres at homes and bars across the land, as we all watch the next generation of Alzheimer’s patients and suicide victims ride on to national glory. The conversation centered around our culpability/responsibility as consumers of the sport. As we learn more about the risks involved for the players, and knowing that the owners want the sport to continue so long as it is profitable, do we as fans hold the ultimate key to protecting these guys, in that we can change the channel? Yes, but here’s the problem. The average fan, aside from being enticed by the violence, is able to put some distance between themselves and the players, as they justify watching by telling themselves that these men are being paid millions of dollars to play a game they know is dangerous. 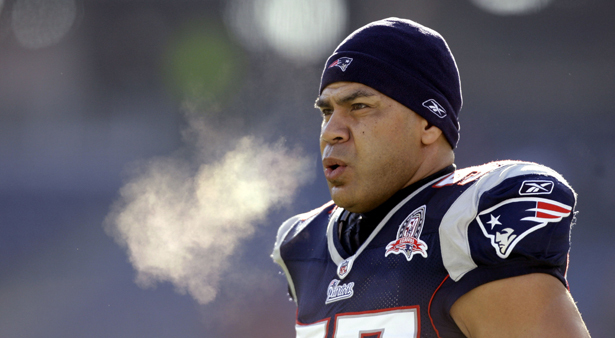 The Seau family’s lawsuit alleges the NFL was not forthcoming about the risks involved with head injuries, and perhaps had he known what those risks were, Seau may have stopped playing. Mary Ann Easterling, wife of Ray Easterling who committed suicide last year, said on Up with Chris that her husband felt “used,” and that if he could go back, he wouldn’t have played. But that dredges up the old cliché: hindsight is 20/20. What would it take for current and potential future NFL stars to give up the game? My guess is more than the threat of CTE. We talk about the culture of violent machismo as a driving motivator behind their choice to play, but it’s even more basic than that. It’s the economy, stupid. The reason there are over a million boys in this country, of all different ages, playing this violent game is that there are millions of dollars on the table, in guaranteed contracts and endorsement deals, available to those who prove themselves capable of strapping on the pads and play America’s favorite sport at the highest level. This is the lottery, and who is more willing to play than those who are most economically disadvantaged? It’s no accident that throughout the year the most celebrated players talk about their humble beginnings coming from poor and working-class families. It’s also no coincidence that so many of them are African-American. Sixty-seven percent of NFL players are are African-American. Why? Because this is a hustle, and so long as African-Americans are disproportionately represented among the poor, they’ll also be disproportionately represented in the NFL. As much as players, particularly the black ones, are chastised in the media for their lavish lifestyles, an NFL contract is the economic hope of many poor black youths and their families. There may only be little more than 1,700 African-American men with deals, but that is still 1,700 six-, seven- and eight-figure deals that families and friends of the players are relying on for their economic security. For all the expensive cars and frivolous clubbing, these guys are also propping up immediate and extended family on their salaries. As the checks get bigger, it’s not surprising the number of kids playing at earlier and earlier ages increases. For too many, this is their answer to debilitating poverty. So what’s a little permanent brain damage? We can wait for the cultural shift to take place, where football no longer figures so prominently because soccer and basketball have overtaken our imaginations, and then we no longer have to concern ourselves with this messy business of brain injuries. Or we could improve the economic conditions of the poor and working class, especially those of color, and no longer render them dependent on the idea of huge paydays from a major breadwinner putting his future health at risk, and see how that works out. Until then, go Ravens, I guess. Dave Zirin has more on the Super Bowl, specifically how the 49ers and the Ravens have helped promote LGBT rights.